You will get at 10am to the Priority access entrance of Notre-Dame Cathedral. Once you will have collected your audio guide, walk down the aisles, transepts and the nave of this imposing building, which construction took almost 200 years. You will admire the sumptuous stained-glass windows, the big organ, the Treasury and the many works dedicated to the Virgin Mary, such as the Pietà. 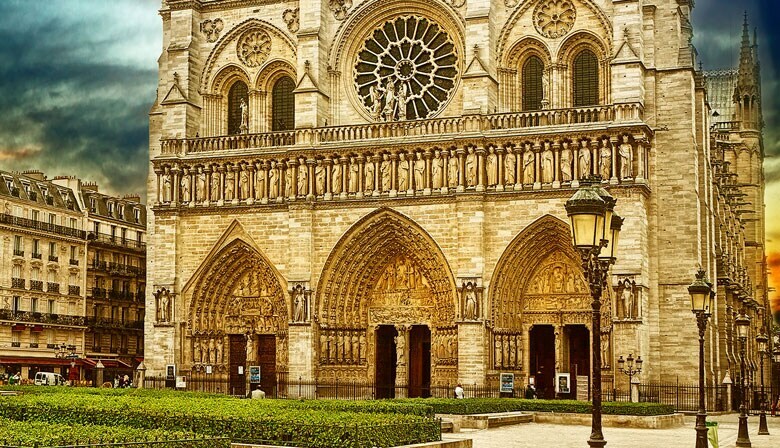 After immersing yourself in the quiet atmosphere of this architectural splendor, go out on the Notre-Dame forecourt, marvel at the beautifully carved central façade and listen to the bells ringing. At the end of your visit, walk around the Île de la Cité, in the historic heart of the city of Paris. Then you will get to PARISCityVISION Louvre agency at 2pm to collect your Louvre museum tickets and audio-guides. Thanks to your skip-the-line ticket, you will be able to quickly get into the most visited museum in the world where you will admire some of the most famous works of art throughout the rooms. The audio guided comments will allow you to discover the history of the museum and its art masterpieces such as the Venus de Milo that represents the goddess Aphrodite, the must-see Mona Lisa of Leonardo da Vinci, the Winged Victory of Samothrace and many other wonderful paintings. Take the time to look at the paintings and sculptures as you wish and stroll through this former Royal Palace. At the end of your visit, don’t forget to go back to our agency to give the audio-guides back. If you wish so, you can end up your day with a walk in the beautiful Tuileries Garden. You must start your tour with Notre-Dame-de-Paris at 10am. You will then have to get to our agency at 2pm for the visit of the Louvre. This tour is not suitable for disabled people, there is no lift on the tour route. - Pick up your audio guide at our Louvre agency. A deposit of 30 euros per audio guide will be required at the agency upon the departure. - You will need to return the audio guide at the agency at the end of the tour, your deposit will then be given back to you. - The new anti-fraud procedure of the Louvre now requires the full name of each visitor or the reservation can be cancelled at the last moment. The museum can refuse admission if the name indicated does not match the one on the ID card, and no refund will be possible. - Get inside the Cathedral with proof of identity for the loan of the audio guide device. Your ID will be given back to you in exchange of the audio-guide at the same location. - Please note that a correct outfit is required: Shorts, off shoulder dresses, miniskirts, etc. are not accepted. You will receive your confirmation and your voucher by email. Please print your tour voucher and hand it over at the audio guide loan desk inside Notre-Dame Cathedral.